Surat: Surat, which aims at becoming the first solar city of the country, will have 25MW of installed capacity of solar power by February 2019. It already has 15MW of installed capacity of solar power and tops the chart in the country. In all, 4,000 solar panels of different capacities were installed in the city which produce 15 megawatts (MW) of solar power. The city administration had received 4,500 applications from residents and commercial establishments in the first phase until September 24. It received another 1,000 applications in the second phase that began from September 24 and ends next year in the same month. “The second phase will help add another 10MW in the installe capacity of solar power to take it up to 25MW,” said KH Khatwani, additional city engineer, Surat Municipal Corporation (SMC). 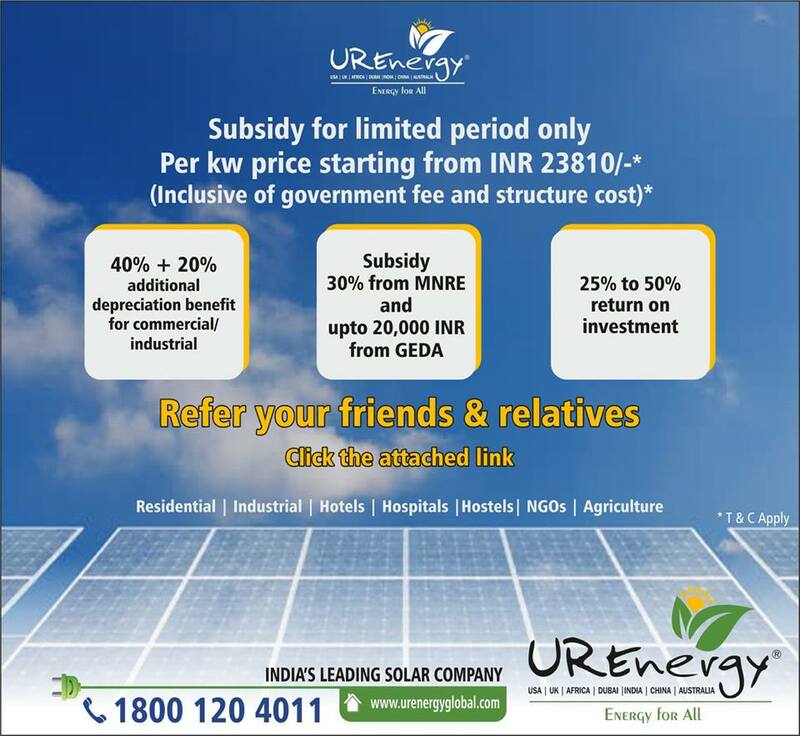 The ministry of new and renewable energy has increased subsidy on solar panels to encourage use of clean energy.Before September 24, 2018, one KV solar panel used to cost Rs69,000. However, one can now buy it for Rs48,300. “The rate of conventional energy has gone up by 3 to 5 percent while the cost of solar panel has fallen. This may encourage people to install solar panels on their rooftops which will bring down their energy cost by at least 50 percent in future,” Khatwani added. The Energy and Resources Institute had carried out a survey 18 months ago and it found that Surat had a potential to generate about 418MW of solar energy from panels installed on rooftops. Rooftops of houses in the city can generate 179MW, commercial establishments 210MW, educational and health organizations 23MW and government offices 6MW of solar power. Solar panels on SMC buildings already help produce 5MW of solar power. Surat expects to produced 50MW of solar power by September 2019.